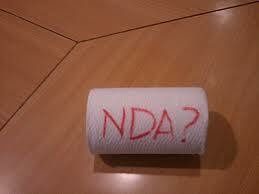 To NDA or not to NDA? 9,99 of every 10 entrepreneurs that pitch me ask me for an NDA…. the other day even my brother asked me for one… that made me think, specially since I’m super careful about it. Entrepreneurs that have met me have probably been asked if a part of their information, or even their names, could be shared with either a partner or a co-investor. I clearly understand their desire to keep they ideas safe but cant really bring myself to agree with the request. As per my previous post, Brazilian entrepreneurs have to learn to share their ideas. Part of it will demand that they develop a trusting relationship with their advisors. But more than that, they have to understand that it is not my business to do a startup… my business is to invest in one and help it grow. Therefore, I will never take their idea and try to set a company up myself. If they are concerned that I will share their ideas with portifolio companies, that is slightly more reasonable, but i wouldnt risk my reputation and career over it. If their idea is so AWESOME, I will probably want them to develop it and invest in them. Also surprising to me is that the thing that they are most secretive about is not their business model, product or delivery method. They are more concerned about their financials. Don’t they realize that this is likely to be the least valuable part? First, it is probably way out of whack. Second, even if it is right, I will know that you will make a lot of money but that is no good to me if I don’t know how . 1 We do look at many companies in the same space and virtually anything that you present to us, we will probably also see from someone else in the same space. 2 we are very concerned that non invested, disgruntled entrepreneurs will claim breach of agreement at anything an invested company does. Great products are great because they were well made, not just because they were based on a good idea.